AMR is not a new topic to anyone involved in livestock and food production, and there is a wealth of information raising awareness and imparting knowledge about how to tackle the issue, plus many examples of Government interventions, NGO and industry-led initiatives. 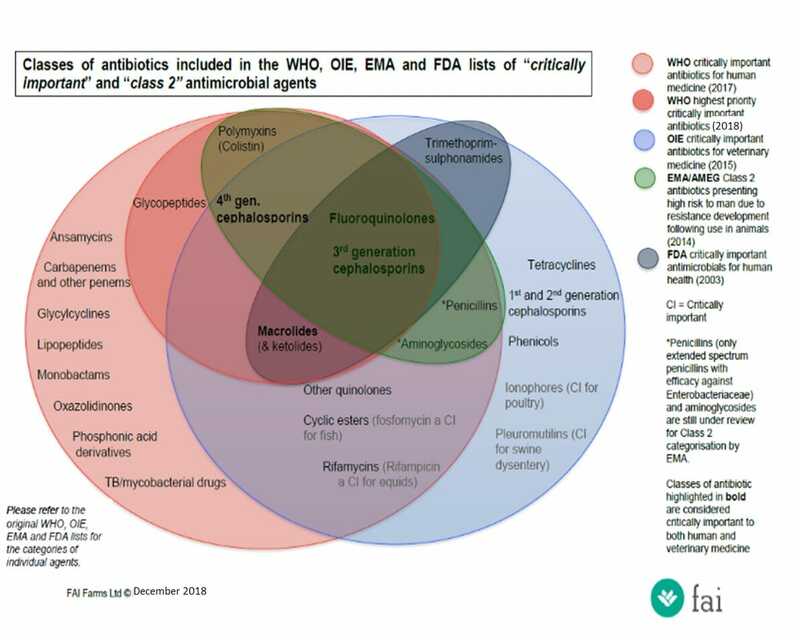 The aim of this article, however is to highlight the significance of the extraordinary mobility and potency of horizontally transmissible genetic elements of antimicrobial resistance (also called antimicrobial resistant genes, or ARGs), and the necessity for co-ordinated and rapid global responses to new and emerging threats. ARGs do not respect geographical, political or bacterial species boundaries. They spread very widely and rapidly, and they can be found in all bacteria, not just the pathogenic ones. This reservoir of transmissible resistance is known as the ‘resistome’. 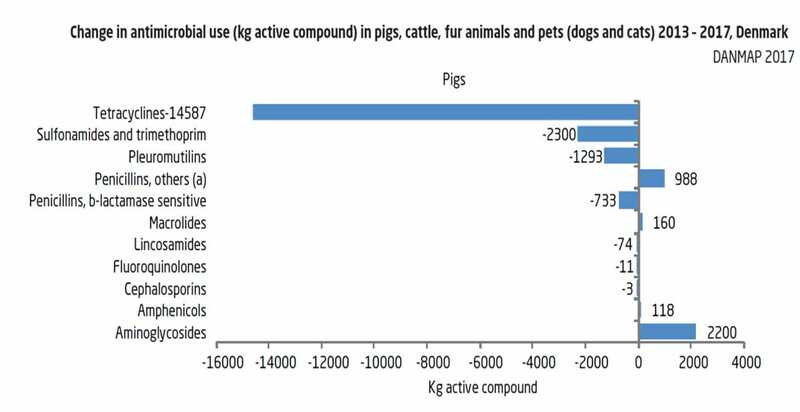 "Overuse and misuse of antibiotics in both humans and animals has dramatically increased the size and diversity of the resistome, underpinning the dire position we find ourselves in now." The emergence of horizontally transmissible colistin resistance in China in 2015 (Liu et al. 2016), and its rapid global spread, is one such example – and one that is particularly pertinent to the pig industry. Colistin is an antibiotic in the family of polymyxins. It was not commonly prescribed in humans due to its potential for renal toxicity. However, with the increase in global AMR, colistin is now considered the last line of defence for several multi-drug resistant Gram-negative infections in humans – its value in the treatment of life-threatening infections needs to be preserved for as long as possible (Rhouma et al. 2017). Historically colistin has also been a mainstay antibiotic used in pig production systems across the world – often in the prevention of post-weaning diarrhoea, PWD (Kempf et al. 2013). This usage did not come under particular scrutiny in the early days of the AMR debate, because any resistance to colistin, observed up to that point in time, was non-transferrable genome mediated, meaning it was not considered likely to amplify and/or disseminate rapidly (Rhouma et al. 2017). However, with the discovery of the mcr-1 plasmid mediated gene, in Escherichia coli isolated from people, pigs and retail meat in China in 2015 (Liu et al. 2016), this all changed. Suddenly there were ARGs to colistin with the ability to transfer horizontally between different bacterial species, sounding warning bells in the scientific community across the globe (Hu et al. 2016, Tse & Yuen 2016). 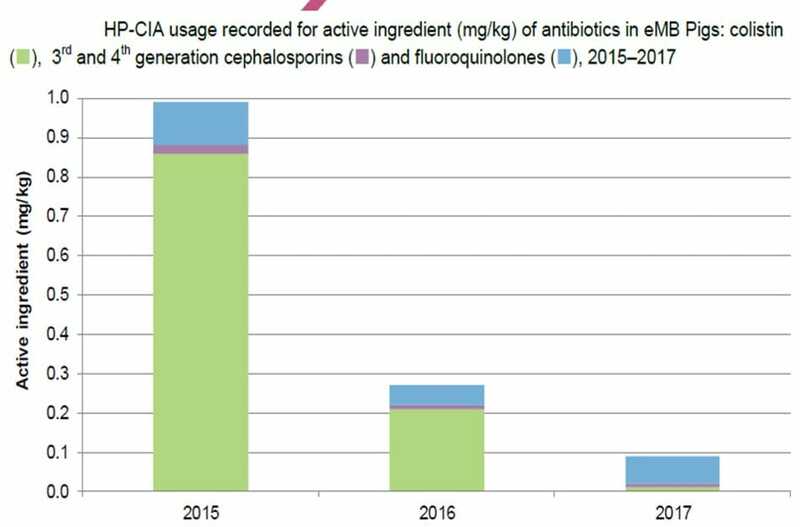 - WHO added colistin to their list of highest priority critically important antimicrobials, HP-CIAs, along with the now well-known list of fluoroquinolones, 3rd and 4th generation cephalosporins, macrolides, and glycopeptides (WHO 2017) (Figure 1). - The Chinese Government banned the use of colistin in feed for livestock (Walsh & Wu 2016). - The European Medicines Agency, EMA, added colistin to their Category 2 class of antibiotics, which includes medicines reserved for treating infections in animals for which no effective alternative treatments exist (EMA 2016). 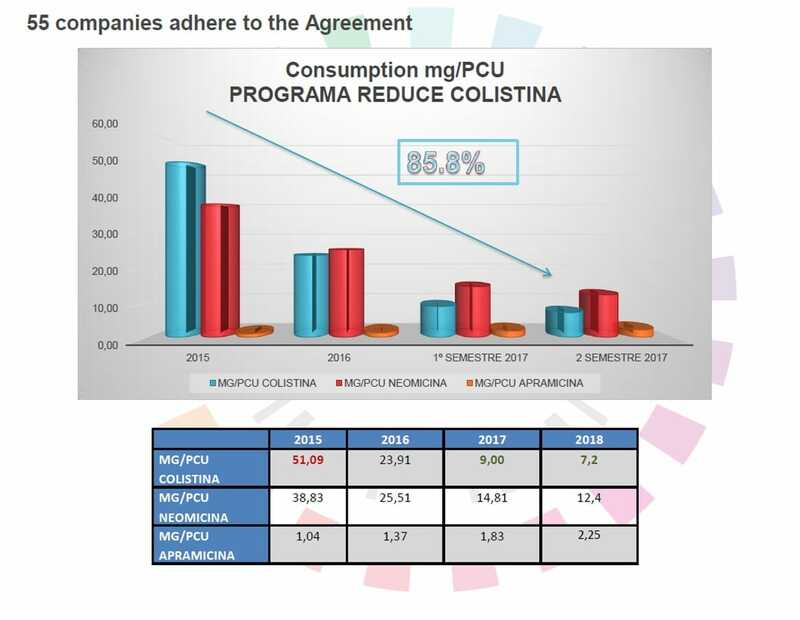 - EMA also advised all Member States to reduce colistin use to a target of 5mg/PCU (population correction unit). EMA cautioned that reductions in colistin use should be achieved through improved animal health, and not by the use of other antimicrobials to compensate. How did the pig industry react? 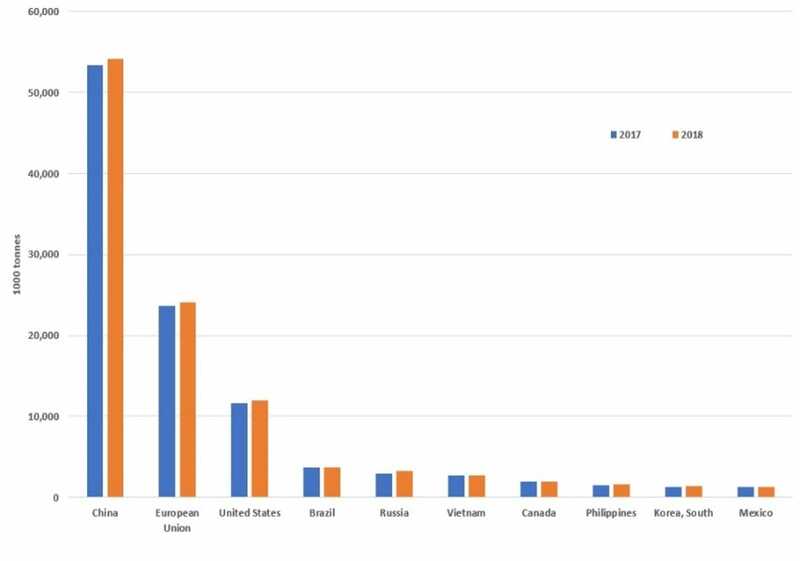 The biggest global producers of pork are China, EU, and the United States (Figure 2). 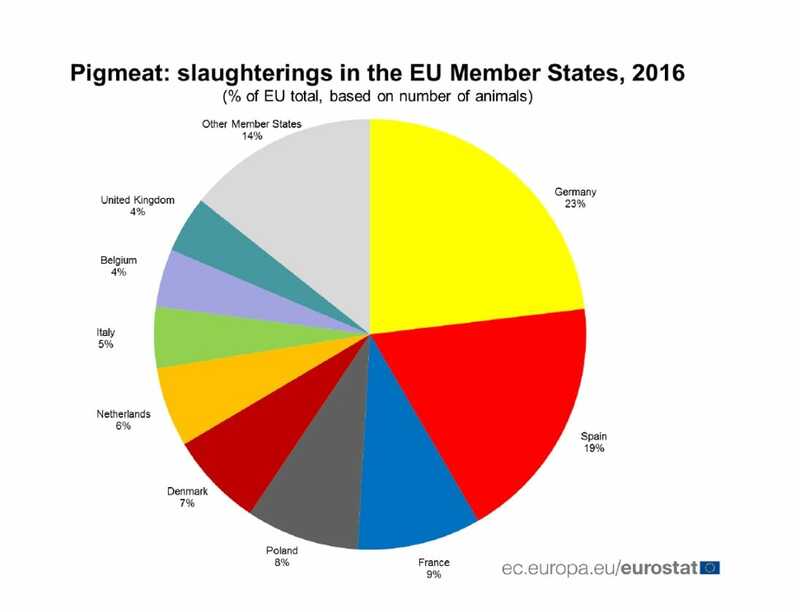 Within the EU, the biggest producers are Spain and Germany (Figure 3). - China banned the use of colistin in animal feed. - In the US, colistin is not marketed for livestock use, although the mcr-1 gene has been isolated from pigs in the US (Meinersmann et al. 2017). 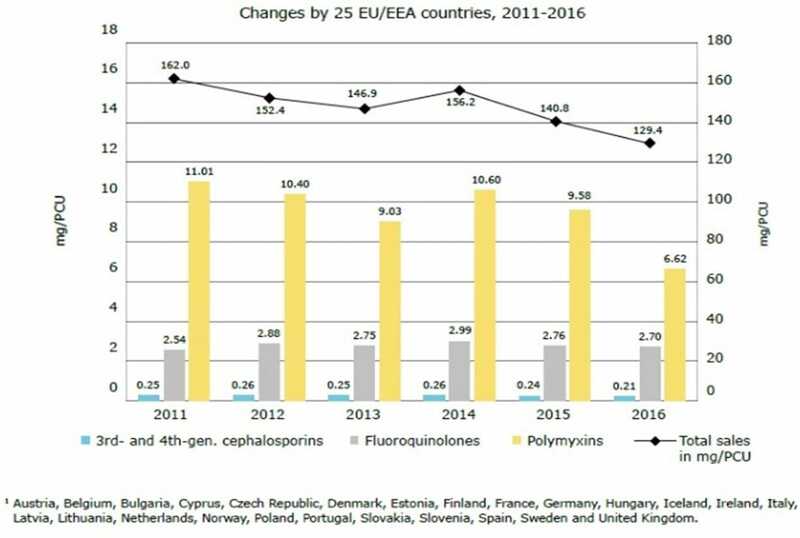 - In EU countries, colistin was still being widely used in pig production systems prior to its addition to the list of HP-CIAs in 2016, despite reductions in total antimicrobial usage (Figure 4) (from EMA 2018). Colistin reductions are however, now being reported. For example, recent data from Denmark, Spain and the UK demonstrate encouraging trends (Figures 5a,b,c) (from Danmap 2017, Sacristán Álvarez 2018, UK-VARSS 2018). 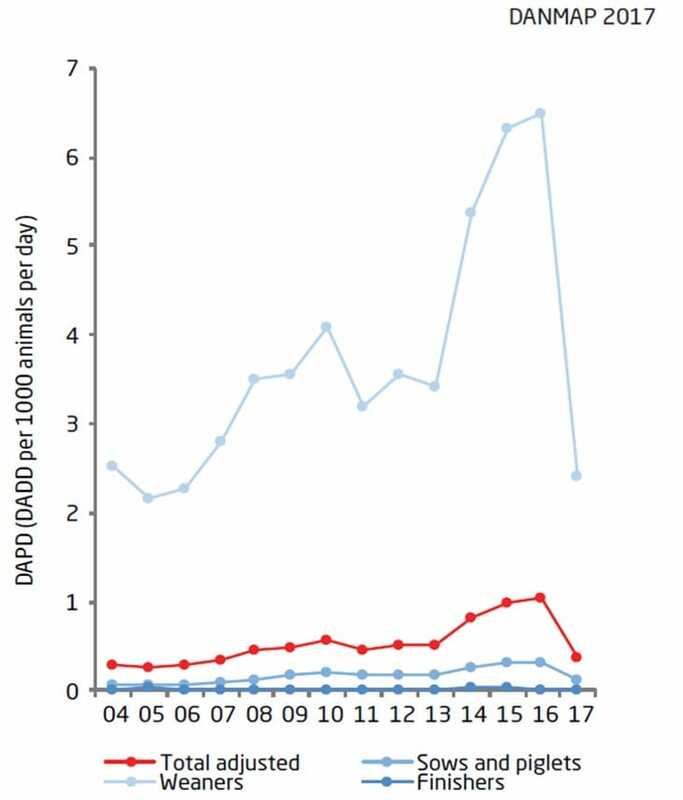 Data from Denmark (Danmap 2017) (Figure 6) indicate that as the use of colistin has declined, so the use of other antibiotics (penicillins, macrolides and aminoglycosides) has increased, suggesting that this may be compensatory use, and that tackling PWD is proving challenging. Tackling AMR is not about focussing on zero-usage. It is about focussing on improving and maximising animal health and welfare, to minimise the necessity for antimicrobial use. Routine preventive use is a particular issue that needs to be addressed, and success may require systematic change and human behavioural change. Progress from the pig industry in many countries to date has been impressive, but the complex causality of PWD, together with problematic endemic pig diseases (such as PRRSV and Mycoplasma hyopneumoniae), and unpredictable future bacterial attempts to outwit us humans, will pose ongoing challenges for the industry.